Every year, The Country Basket Flower Boutique staff eagerly await Pantone’s announcement for their choice of the Colour of the Year. This year, we got a bit of a surprise! The colour of the year is a very important indicator of where the trends are going. For the Country Basket Flower Boutique team, knowing the colour of the year helps us to predict which colour table linens, bridesmaid dresses, and colour schemes our brides are likely to choose in the coming months. In turn, those choices will help us determine what the bridal parties' bouquets, boutonnieres and corsages will look like. This year, those of us in the colour industry have all been thrown for a loop! We were surprised to hear that Pantone chose not one, but two colours for 2016: Rose Quartz and Serenity! But even if you’re not planning a wedding, you should still be interested in what the Colour of the Year is, as you may find it influences your colour choices in the year to come. When you’re out and about shopping for yourself or for your home, you will be seeing clothing, shoes, home accessories and all sorts of things in Rose Quartz pink and Serenity blue. IKEA, for instance, as well as the kitchen appliance company Kitchen Aid, will be releasing products this year in these two colours. Staying On-Trend But On-Budget, with Flowers! If you're anything like me, you want to stay current with trends so that you don’t get stuck in a rut, but you don’t necessarily want to invest in new furniture, appliances, paint or other expensive items for something so transitory. Not to worry! Bringing Pantone's Colours of the Year into your home can be done without too much fuss – and without spending a fortune. 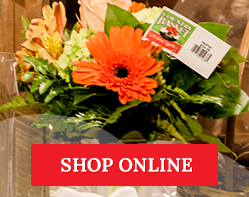 It's easy to update your home and stay on-trend by simply picking up a bouquet of fresh flowers! Roses, camellias, poppies and gerberas all come in shades of Rose Quartz. 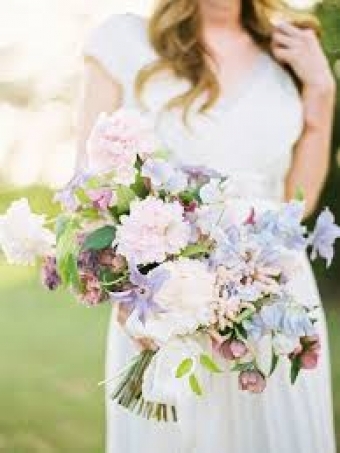 And Serenity can be found in delphiniums, bachelor’s buttons, hydrangeas and grape hyacinths, to name a few. The soothing combination of Serenity and Rose Quartz blooms will lift your spirits and help you stay on trend! Get in Touch with Country Basket Flower Boutique today, and we'll help you create the perfect floral arrangement for your home with Pantone's Colours of the Year!